HOUSE AT 100 N. Arden has stood the test of time. The following is from an article by Dr. Earl Moody, who built and lived in the house at 100 N. Arden Blvd. 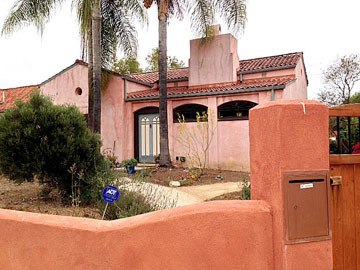 Adobe buildings in Southern California and in Los Angeles have been frequently written about. Those remaining are the relics of the early California culture of Mexican life. When this district was first developed, many adobe residences were being built in Walnut Park, a subdivision of Huntington Park. As a boy, I spent many hours of many days playing in an old adobe one-story rambling home, the residence of the caretaker for the remaining farm land of the Rancho San Pasqual. I remember the very deep recessed windows, the large airy rooms with heavily beamed ceilings and the Spanish tiled roof. The memory of this building and the wonderful times I had in it as a boy, and the then present building activity in Walnut Park, sparked my desire to build an adobe home in keeping with the early Southern California Mexican culture. This area of wide-open fields was subdivided by a realtor named Schultz in 1919. He opened a small office at the northwest corner of Larchmont and Third St. The area west of Larchmont between Third and Beverly, but not including Hancock Park, was called Windsor Heights. The area east of Larchmont was called New Windsor Square. The streets were opened and sidewalks were put in but streets were unpaved until several years later. In 1919, we purchased the northeast corner of First and Arden (Arden was then known as Vine St.) where my wife and I started our first home. We purchased a set of plans from the company building adobe houses in Walnut Park. Then came the problem of finding someone to make the adobe bricks. A Mexican friend, manager of the brickyard and kilns on E. Seventh St., found someone who was an expert adobe brick maker. Our plans called for a cellar. The excavation of adobe from this cellar, plus one wagonload of adobe soil from the grading operations of First St. East of Larchmont, was the source of the material from which the adobe bricks were made. The expert thoroughly wet this adobe soil into a soft pliable mud and with bare legs and feet worked the proper amount of stable manure and straw into the mud to give the dried bricks proper binding power. When properly blended, this mud was placed into a wooden mold 12 by 22 inches and four inches deep. On each long side of the mold, every four inches were wooden strips one half-inch thick to leave an indenture in the bricks to give better binding power to the inside and outside finished plastered adobe walls. As soon as mud firmed a bit, the form was removed and the bricks dried in the sun. Next came the permit and the city building specifications. The specifications required by the city were so strict that building for an adobe structure, if now permitted, would be prohibitive in cost. For a one-story adobe building, the concrete foundation needed to be two-feet thick, one foot below ground level and one-foot thick to the floor joist level. Over each opening in the outside walls, a foot square reinforced concrete lintel was required with a bearing of one foot on the adobe wall on each side of every opening. In constructing the walls, the adobe bricks were set in lime plaster. The outside walls were covered with cement stucco and waterproofed to keep the rain moisture from the adobe bricks, which if wet, would swell and thus crack the stucco plaster (a costly lesson we soon learned). This building has withstood all the earthquakes that have occurred since it was built, and has suffered not a bit of damage. Even the adobe chimney has withstood the shakes. The Avila Adobe on Olvera Street has the distinction of being the oldest standing residence in Los Angeles. Built in 1818 by ranchero Francisco Jose Avila, a native of Sinaloa, he was mayor of L.A. in 1810. Today, the house is a city, state and national landmark and museum, furnished as it might have looked in the 1840s. Open Monday through Sunday 9 a.m. to 4 p.m.